Those Native American protestors who gather at the ironically named Progressive Field—some of them members of the Cleveland American Indian Movement (AIM) and the Committee of 500 Years of Dignity and Resistance—have not been met with open arms or friendly words. Cleveland’s baseball fans have hurled beer cans and spat on them. The protesters have been called stupid and “Custer-killers”—although it’s not absolutely clear whether that last description is an insult or a compliment. Cleveland AIM calls the use of the Chief Wahoo mascot “bigoted, racist and shameful,” and the Committee of 500 complains that the logo is a negative stereotype against indigenous people. 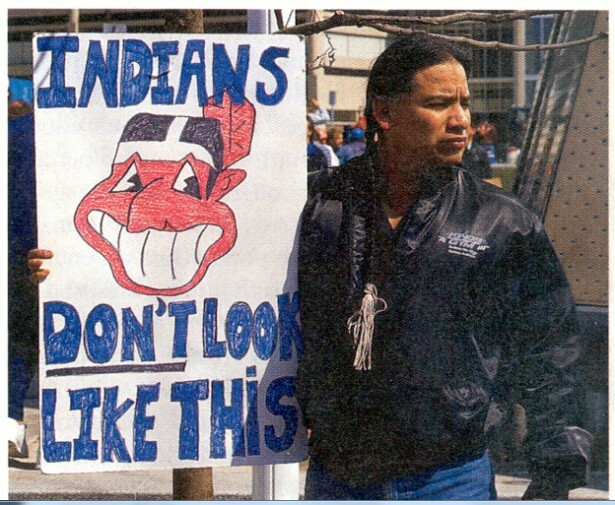 FULL ARTICLE: Standing Up And Staying Put: Two Decades of Protesting the Cleveland Indians’ Chief Wahoo – ICTMN.com.